In May Microsoft in Redmond shared the news of their Azure Cloud Collaboration Center. This facility is a first of its kind. 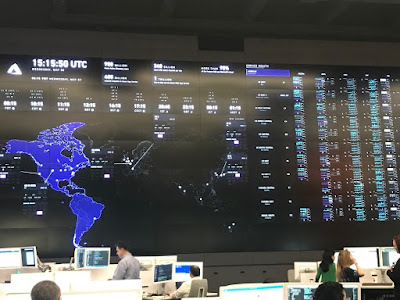 The Cloud Collaboration Center space shows customers a snapshot of what is happening with their data 24/7 and enables real-time troubleshooting of issues by multiple teams simultaneously from across the organization. It combines innovation and scale to address operational issues and unexpected events in order to drive new levels of customer responsiveness, security and efficiency. It is great to see a space for correlation of information with the possibility to pull the data up on individual workstations. I think this kind of collaboration is great news for customers.